Carey, drawn to the ocean since childhood in Jamaica, continues to fish and dive in Florida. His love of the sea shines through in his dramatic paintings. Carey’s works have graced the covers and pages of numerous tournament programs and fishing magazines. His wall-sized murals are on display in many of the world’s fishing destinations, including St. Thomas, Venezuela and Miami. When he’s not in his studio or at sea, Carey spends time preaching conservation or raising money for various charities including The Miami Project to cure Paralysis, The Boys and Girls Club, YMCA, Make a Wish, Cystic Fibrosis, Miami Children Hospital and more. 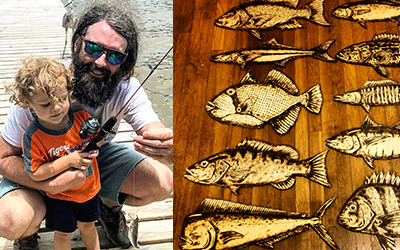 Artist Patrick Tucker from Alabama enjoys fishing and the outdoors. He says, "One of the big reasons I really dove into making art is to show my son that you CAN do what you love and make people happy while doing it!" Patrick is both a painter and pyrographer (the art of burning a design on the surface with a heated metallic point). He specializes in depicting various species of fish on wood and swordfish bills. His works are on display at various galleries and shows. Manny Puig is a well known outdoorsman, entertainer, and hunting guide, but has been gaining increasing fame for his distinctive artwork. He is inspired by the wildlife that he works with and has a photographic memory for the detail in each of his subjects. He is known for his high-end, very realistic bronze sculptures of fish, sharks, and alligators. He also hand carves primitive weapons and shark tooth necklaces out of stainless steel -- each one individually designed, crafted, and signed, using specialized tools. 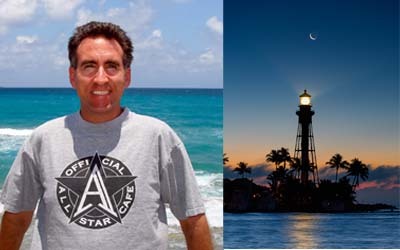 Steve is a local artist who was born in Boston, Massachusetts, and moved to Florida at one year old. He attended Ft. Lauderdale High School and Broward Community College. 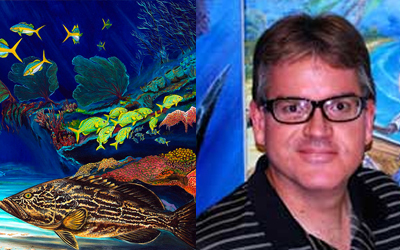 He specialized in marine art, both fish and reef scenes, and he works with acrylic, oil, and pencil. 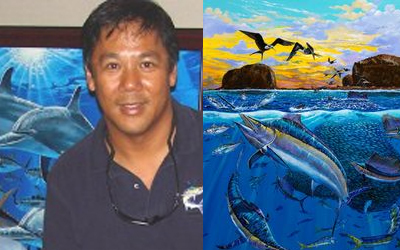 He exhibits regularly at the Sailfish Marina outdoor show and has designed the artwork for many fishing tournaments. He enjoys fishing, diving, photography, cycling, and painting. 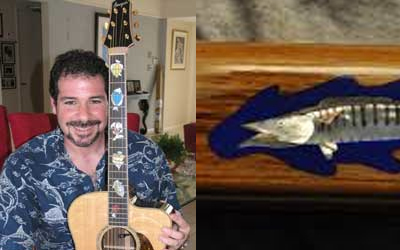 Craig began creating marine life inlays in 1999. 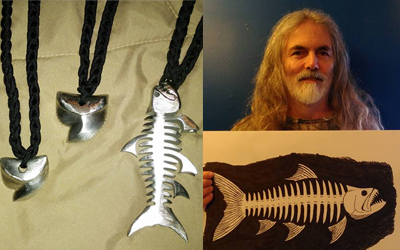 With a background in marine biology, living reef husbandry, sea turtle ecology, and scuba, he is a self trained artist beginning his career in inlay after prior time spent as an aquarist for a local science museum, and as a high school marine biology teacher. Drawing on his passion for marine life as well as the inlay art form in general, he has become one of the foremost inlay artists working, having produced museum quality collectible pieces for CF Martin guitars, Kamaka Ukulele, numerous hand build luthiers, as well as high end international private collectors, Vantage Automotive (Rolls Royce custom shop), rock stars, and other respected luthiers and guitar companies/collectors from all over the world. Scott’s camera is focused on capturing what is beautiful and unique in nature — dramatic landscapes, shimmering waters, unsuspecting wildlife, the vibrance of sunrise and sunset. Growing up on Sanibel Island, he developed a lasting passion for the ocean, fishing, and shell collecting. Scott also has a successful career as a software engineer and combines his analytical mind with his love for nature, in search of that perfect shot. His work has been featured in an article published in Practical Photography Magazine. He has been asked to display at various exhibitions, has won numerous photo contests, and plans to take his passion to the next level. Chris Gillette Chris has had a passion for animals, especially toothy ones, since a young age. 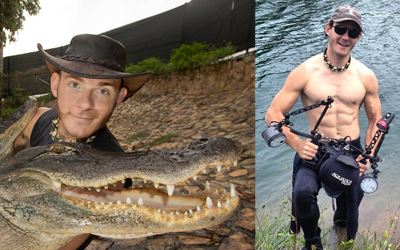 Aside from being a devoted photographer, Chris’s passion has also fueled a career as an entertainer, television personality, and a researcher with a degree in Environmental Studies from FIU. His work has taken him to the jungles of the Peruvian Amazon, the Costa Rican rainforests, the Banco Chinchorro atoll in Mexico, and across the United States. Chris's unique skills allow him to bring the camera lens close to oceanic pelagics, swamp creatures, and more. His photos have been featured in numerous magazines, books, and art displays. 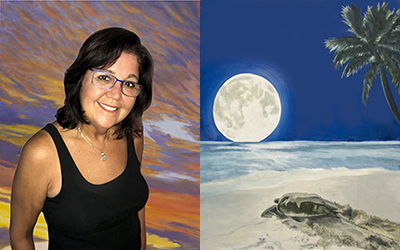 Sue is a professional artist specializing in oil paintings of the sea. She studied at Parsons School of Design and the Art Institute of Fort Lauderdale. Traveling and exploring Florida and the Caribbean while creating exotic destination brochures have won her a number of ADDY awards and transformed her painting style into a unique blend of realism and abstraction with a Pacific style and Caribbean flair. Sue exhibits at various shows and has won numerous awards. You can see her paintings at Art on a Whim Fine Art Gallery in Islamorada Florida. 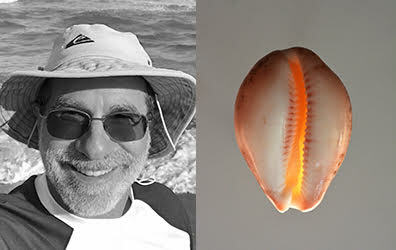 Based in South Florida, Ronald's work focuses on the study of seashells and corals that he finds in southeastern Florida. A veteran photographer and beachcomber, Ronald has spent many years shelling in Florida and the Bahamas. He has exhibited extensively with a number of solo shows of his abstract photography. All shells are self-collected and none are taken live. 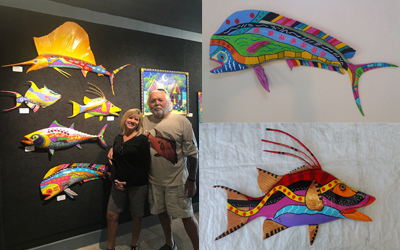 Exhibits include: Sanibel Shell Show (Blue Ribbon 2017), Broward Shell Show (Best of Show Award 2018, Blue Ribbons 2018, 2016), Norton Museum of Art; Pulse Miami Beach, Mulry Fine Art, Palm Beach 3. Carlos Barbón is an art director in the catalog industry working with major clients such as the Sports Authority and Macy’s. 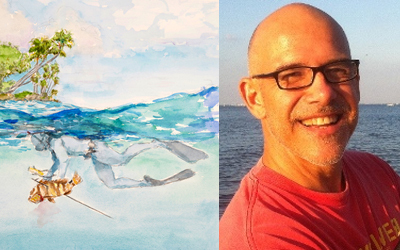 Barbón now turns to spearfishing watercolors, his life-long passion, capturing the lifestyle and comradery found in the spearfishing world. His favorite medium is watercolors and graphite “because they lend themselves beautifully to ocean themes and the tropics”. Carlos Barbón graduated from Florida State University with a BA degree in art and a minor art history. Barbón is a member of the South Florida Free Divers and the Florida Watercolor Society. Catherine is a newly emerging artist with a deep love for the ocean. Her present works are mainly in watercolor as she loves how the water reminds us of the importance of flow and surrender in our ever busy lives. She works full time at a southern California children’s hospital but is usually found painting, playing with her two beloved pups, scuba diving or free diving. 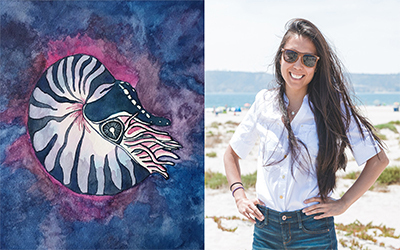 With degrees in animal science and epidemiology, she is now merging her love for art, people, and the oceans and hopes it is one way that humanity can come together to care for our precious waters, heal within, and inspire hope for the future. Ray grew up on the family fish docks on the west coast of Florida. He got a BA in Anthropology from FSU and traveled through the jungles of South America. Acrylic/oil paint over fiberglass, his fish are anatomically exact, and he casts them himself from original molds. His "Floribbean" style is a fusion of the Caribbean and Florida arts, with bright, bold colors. His works can be found in galleries from Hilton Head, South Carolina, to Key West. 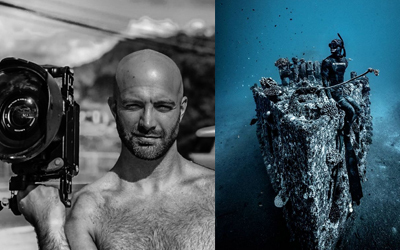 John combines his background in freediving, his love for the ocean, and his passion for photography to capture stunning underwater images. He is a certified freediver and is obtaining his instructor certification. John displays an array of images including marine life, as well as people, in an artistic manner. He has been featured in newspapers, several websites, and Hawaii Skin Diver magazine. He hopes his passion will inspire people to explore, protect, and expand efforts in ocean conservation. 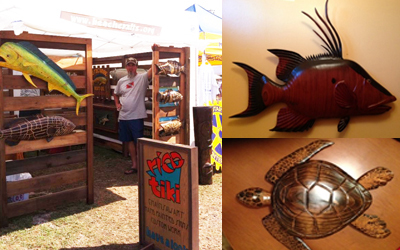 Rico Tiki is an attempt to combine a lifelong love of wood working and the oceans. Years of diving provided the inspiration to create realistic representations of what I had observed in places like Bermuda, Bahamas, the Keys and locally. Using salvaged materials, chainsaw, various hand tools, each piece is shaped individually, and each detail is done by hand with brush or rag. My aim is to provide a 100% original, one of a kind pieces of art. Dr. Madigan has long been taken by the mysterious lifestyles and powerful physical forms and colors of open ocean fish. Dan received his PhD in Marine Biology from Stanford in 2013 and has published over 40 research papers and book chapters. He had his first gallery showing recently in Stuart, Florida. 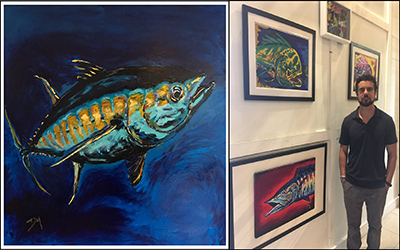 Many of his fish are painted entirely without brushes (hands-only), which he feels forces him to better capture some of the raw energy and colors hiding in the fish. Dan gets into the open ocean whenever he can, for fishing, diving, research, or just the simple experience of being in his favorite habitat.